Hello Loves. 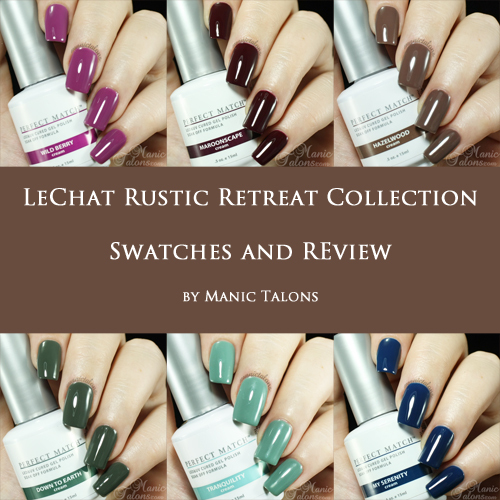 I have swatches of the LeChat Rustic Retreat Collection to show you today. The Rustic Retreat Collection is composed of 6 earthy creams that are perfect for fall. This is a Perfect Match collection, which means they come in a set of gel polish and matching traditional lacquer. LeChat is a brand that continues to impress me. I'm not sure why I haven't swatched more of their offerings. The formula is fantastic! Ready for the swatches? The first shade in the collection is a warm, berry toned purple called Wild Berry. This is a very creamy gel. I can't get over how beautifully it applied. Completely opaque and flawless coverage in two coats! Maroonscape is a deep, vampy maroon cream with slightly brown undertones. This one also applies like a dream and is opaque in two coats. Unlike a lot of dark maroon gels, I found this one cured beautifully in just 30 seconds in my Couture Espree LED lamp. Hazelwood is a lighter, medium brown cream that has definite stained hardwood tones. It reminds me of the weathered and loved rocking horse my father made for me as a child. I'm oh so tempted to use it as the base for a wood grain mani. ;) Like the others, application was flawless in two coats. Down to Earth is a mossy forest green cream. I found this one to be slightly thicker than the others, which made it a tad tricky to apply for me. I had to go a little thinner on the coats than I usually would to keep it from wrinkling on the side of my pinkie nail. With that said, it is a gorgeous color and the application issues I experienced are most likely my fault. I have trouble getting the right amount of polish on the brush for my pinkies. I swatched two coats since I had to go thinner, but this one could easily be a one coater. Tranquility is what I would describe as a dusty sea foam blue cream. I don't know if that's an accurate description or not, but it's what comes to mind for me. Oddly enough, this is my least favorite in the collection. The color is quite pretty, but it's just not my cup of tea I suppose. Application was dreamy. Finally, My Serenity is the perfect navy blue cream. This one is my favorite hands down. (Imagine that...a blue is my favorite. lol) Not only did it apply beautifully, but I had no issues with staining from soak off that are common with darker blues like this. And just look at her! She's stunning! Amazing depth without needing even a hint of shimmer. Be still my heart! Now is probably a good time to apologize for the sub-par photos in this post. I have no clue what happened, but apparently my ISO setting on my camera had been changed so the pictures have more noise than usual. This was the first collection I swatched as I was recovering from pneumonia, so I'm blaming it on that. ;) I considered reswatching them, but I don't think the extra noise impacts the color too much so I decided to just go with it. What do you think of the Rustic Retreat collection? I personally think LeChat hit it out of the park with this one as I love all but one. :) I passed up the Mermaid Treasures collection that was released before this one, but now I think I might need to grab it too! I think your swatches are great! I hadn't even paid attention to that navy blue before, it's so pretty! I may need that one. I got the whole collection and have no regrets. :) So far I've only worn Down to Earth (you're right, it can totally be a one coater, but I always do more for strength) and a Maroonscape French, but I have plans. Maroonscape RNP is my pedi. I have a feeling it'll be a repeat through fall and winter. Wild Berry is my absolute favorite color of all the many colors I have. It's on my nails now! And I agree with you on application; it is a breeze. Don't Let the Vampires Bite! New Purjoi Swatches and Purjoi Giveaway!